Of all the cities that claim to never sleep, Madrid is up there among the best and most fiesta-driven of them. Madrid comes alive at night and has so many diverse “barrios” (neighborhoods) that it is sure to have something to cater to any and every taste! …or as far down that sequence as you can handle! In this post you’ll find a short overview of the atmosphere and nightlife in the liveliest of Madrid’s neighborhoods, including some tips on which venues to visit; so you can choose your favorites and explore! Puerta del Sol is one of the oldest parts of Madrid and is smack bang in the center of the city. It’s the most popular barrio amongst tourists and foreigners, as it is one of the easiest and most obvious places to start exploring. Trickling back down towards Plaza de Santa Ana and Calle de Huertas, there’s a well-known jazz bar Café Central. Café Berlin is well-known for its live gigs as well as soul-filled funky house club nights. Cardamomo is a decent flamenco spot which can be found in Calle de Echegaray. Gran Vía-Sol has come to be a popular bachelor/bachelorette party destination to celebrate the ‘last night of freedom’. The Independance Club hosts themed nights and parties, and Costello plays rock, indie or funk and is the club of choice of many local bands. The rooftops of the Urban and the NH Collection Madrid Suecia hotels afford a bird’s-eye view of sunsets over Madrid’s skyline and you can’t miss the panoramic views of the city from the terrace of Círculo de Bellas Artes, open until 9pm. 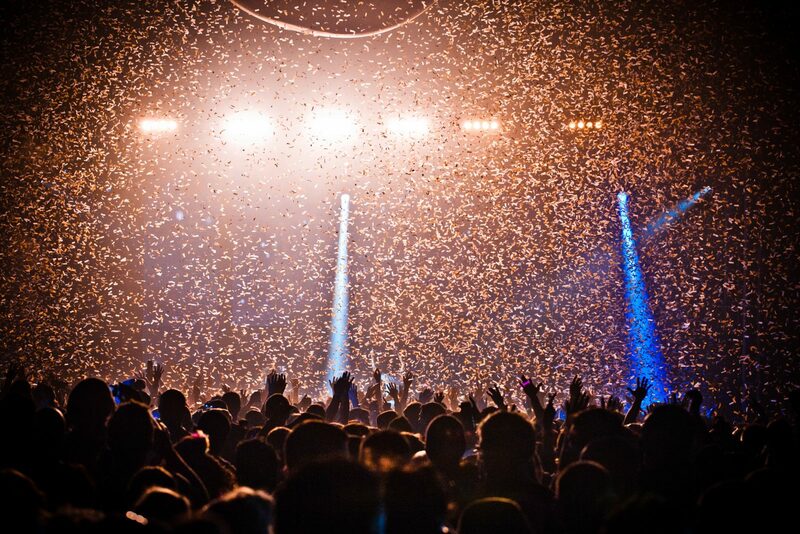 Techno lovers should have a look at Mondo Disko’s impressive agenda and give it a try – you won’t be disappointed. Going up from Gran Vía is where the bohemian/hipster barrio of Malasaña starts. The metro station Tribunal is one of the most popular meeting spots for young people. The alternative rocker vibe of this neighborhood is heavily influenced by La Movida Madrileña of the 80s and 90s. Popular spots include TupperWare, Penta or La Vía Láctea, on Calle de La Palma and Calle Velarde, and the Madrid Me Mata museum-bar. Calle del Pez is home to superb tapas bars like El Pez Gordo, chill cafes and cocktail bars like Cafeina. Plaza del Dos de Mayo is great for drinking a chilled beer or glass of wine in the sunshine and is popular with locals and visitors alike. The GyMage lounge resort has a rooftop terrace with spectacular views in both summer and winter, and it’s open till 2am on weekends. Those with an affinity for electronic music should check out Sala Arena (Zoologico) and Sala Republik, which also does metal and reggae nights. Since the 90s Chueca has been known as the cosmopolitan center of Gay Madrid. The nightlife there is dynamic and flashing with style, and is home to some of the most trendy and edgy bars and nightclubs in town. It is also home to one of the largest Gay Pride Parades in the world and will welcome the World Gay Pride in 2017. There is something for everyone in Chueca. A fantastic rooftop to check out is Oscar’s Terrace at Room Mate Óscar Hotel, which is perfect for a drink during the summer months as it has a pool. Mercado de San Antón also has a rooftop bar (sometimes with free live music) for a casual drink and people-watching. Among the best-known clubs are Delirio, Why Not?, Truco, Fulanita de Tal and Long Play – the last of which is huge, and wildly popular. La Latina is a Sunday afternoon favorite for the locals, but also great to get tapas, wines or beers on any night of the week. Getting around this district has a verb of its own: ‘latinear’, a word that is firmly established in local speech. 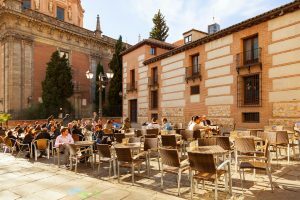 You’ll find madrileños packed into the bars around La Cava Baja, Toledo, Tabernillas, Humilladero or Calatrava: all charming streets lined with tapas bars. The local tradition is to go here on Sunday afternoons after the city’s flea market, El Rastro, and hop from bar to bar until late; drink beer in the squares; or chill at sought-after terrace spots. El Viajero is a remarkable cocktail bar housed in a small three-storey palace built in the nineteenth century, with a restaurant, a cocktail bar and a tapas bar on the rooftop terrace, affording stunning sunset views of the cityscape. Another rooftop we recommend to check out is The Hat hostel, which has elegant, cozy décor and an indoor smoking area with a fireplace. More top spots include Berlín Cabaret, with performances Thursday to Saturday, and Corral de la Morería, one of the best places to watch authentic flamenco in Madrid. Lavapiés is the city’s multicultural neighborhood and is now being embraced for its edginess. It’s a swirling mix of African, Middle Eastern and Latin American cultures, to name just a few and is a melting pot of every type of subculture, from hippies to hipsters. It’s famous for its numerous Indian restaurants and Calle de Argumosa, which is lined with bars and outdoor seating areas, perfect for the warm Madrid evenings. Salamanca is Madrid’s up-market neighborhood, filled with high-end, chic lounges and nightclubs. If you’re looking to celeb-spot, you might spot famous actors and football players at Gabana 1880. The Serrano 41 nightclub is one of the most popular in Madrid and a true icon of Salamanca’s nightlife, boasting three different areas: the terrace, the chill-out space and the dance floor on the ground level, where you can move to the beat of funky, pop and house music after 11pm. Goya Social Club is also known for stylish funky and deep house nights. Arts Club is a popular venue that has a restaurant, a cocktail bar, does club nights and occasionally day-parties on Sundays. Madrid is an incredibly lively city with an amazing nightlife that will leave you wanting more. Now that you have some ideas of where to go out in Madrid, pick where to start and make the best out of your time here! 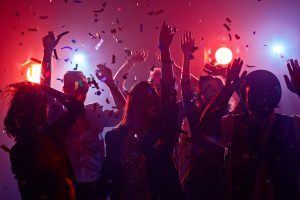 Follow our blog to stay up to date with exciting events in Madrid, and if you know of other great Madrid nightlife spots leave us a comment on our Facebook page.